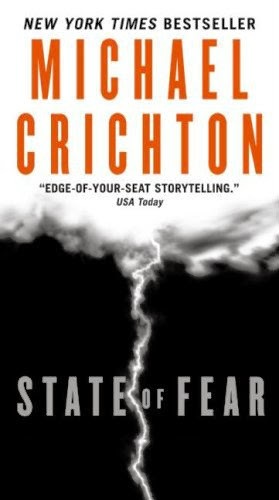 Climate fiction has gone viral for a very simple reason: it deals with climate change and global warming, issues that are getting worse every year. We’ve been used to dire reports from the United Nations Intergovernmental Panel on Climate Change for years but now we are getting one, equally somber report from the United States, long the homeland of climate change deniers: the National Climate Assessment, done with 300 experts. 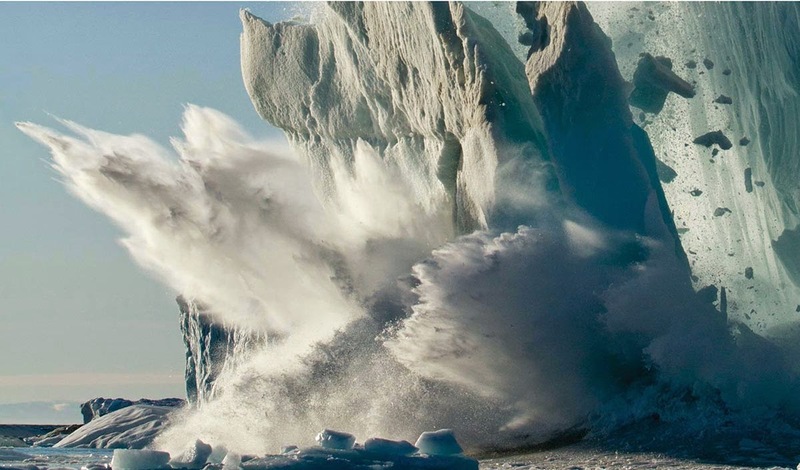 It’s full of information and has some amazing photos (like the one above illustrating the collapse of ice sheets – now on-going in Greenland and Antarctica and adding to sea level rise – photo source: Paul Souders/Corbis). Things have never looked so bad, and it’s not happening in some distant, unlikely future but right now. It’s hard to imagine, hard to go beyond the raw numbers and the (cold) data (or should I say hot?). And that’s precisely why we need climate fiction – because it works on the emotions. And when you realize the problem is here and now and concerns you, well, it’s normal, it makes you sit up! That’s why Nathaniel Rich cli-fi novel Odds Against Tomorrow was eerily spot on. He had imagined New York under water. 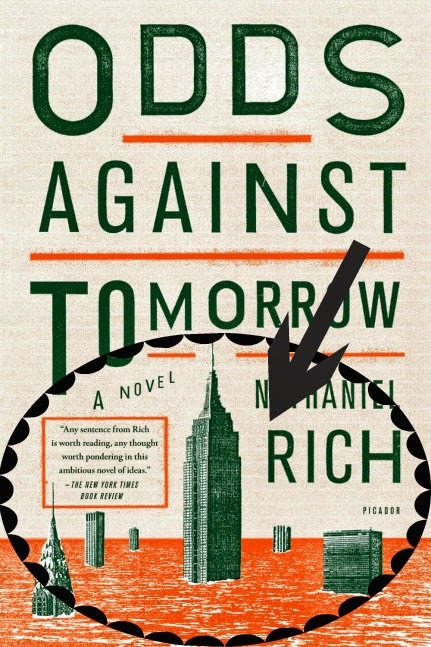 When his editor at Farrar, Straus and Giroux was finalizing his draft for publication, hurricane Sandy hit New York and all of a sudden, Rich’s book didn’t at all look like fiction, it looked like social realism! We have certainly covered ground in 10 years! This illustrates well how broad a genre climate fiction really is, if it can include a book that is music to the ears of climate deniers. Because that is my point: climate fiction, whether you are denying climate change or believe in it, is here to stay – a constant source of inspiration for writers. I would also like to add that climate fiction inevitably will include books that go beyond climate change. Why? Because climate change is but one of the negative trends that will affect our future. The others are well-known and nobody disputes them: an unstoppable population explosion, rapid industrialization especially in developing countries, a world-wide rush to urbanization, increasing income inequality causing social tensions, the multiplication of local wars as weak states struggle to politically emerge and mature in working democracies. The main point here is that all these trends are inter-linked and interact on each other, reinforcing each one. For example, industrialization of itself wouldn’t be so devastating if it wasn’t accompanied by rapid urbanization and rising population, etc etc. How well I’ve explored the future, how realistic it is, I leave it to you to judge! But do let me know what you think – the future of humanity is one of the most important issues facing us all. Your views? Do you think writers have a role to play? I haven’t read climate fiction, but I can definitely see why it’s popular 🙂 Great post! Cli-fi tends to attract really good writers: Margaret Atwood (Nobel prize candidate – I’m sure she’ll get it sooner or later), Barbara Kingsolver and among the young, Nathaniel Rich, just to mention a few. That’s what so exciting about cli-fi: the high level of quality writing! We’re on the same page! I bought Odds Against Tomorrow on your recommendation. Thanks.